Pakistani intelligence agents arrested five Al-Qaida suspects in the northwest city of Peshawar at the weekend, the police said today. “There was a raid by the secret agencies. The police were not informed,” a government official told AFP, referring to intelligence agencies who usually conduct raids without involving the local police. Lure of dollars led to Khalid’s arrest? The lure of 25 million dollars may have made a radical Egyptian to turn over Khalid Shaikh Mohammed, described as the “brain” behind al-Qaida’s operations. Terming as “rubbish” India’s assertions that cross-border infiltration continued in Jammu and Kashmir, Pakistan has said it would raise the Kashmir issue at an Organisation of Islamic Conference ministerial-level meeting, though it was not part of official business. 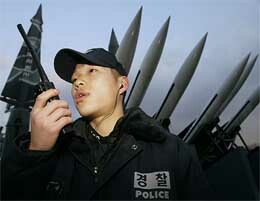 North Korea test-fired a missile into the sea off its east coast today, South Korea’s Defence Ministry said. There had been indications that North Korea was planning to fire a missile. The Sri Lankan Navy destroyed a suspected arms ship of the Tamil Tiger rebels this morning, about 170 nautical miles north-east of Mullaitivu where the rebels have their main base, a top-ranking navy official said. At least 25 persons, including students, were picked up by the police from different parts of Bangladesh today during a day-long general strike called by 11 Left parties and supported by the Awami League, which disrupted normal life all over the country. 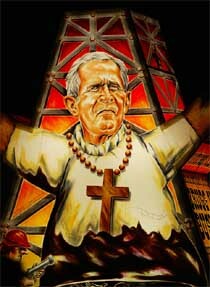 A lantern bears an illustration of US President George W. Bush as the Messiah standing waist-deep in oil at the "Morgestraich" carnival of Basel, Switzerland, on Monday. On the stroke of 4 am, the street lighting of the whole town is put out and the carnival groups play their first march called "Morgestraich" which starts the traditional carnival of Basel. Only the carnival lanterns illuminate the town, dealing with actual events, which is made fun of. Pakistani intelligence agents arrested five Al-Qaida suspects in the northwest city of Peshawar at the weekend, the police said today. “There was a raid by the secret agencies. The police were not informed,” a government official told AFP, referring to intelligence agencies who usually conduct raids without involving the local police. Two Afghans, one Iraqi, one Iranian and another Middle Eastern man of unspecified nationality were picked up in the pre-dawn raid on Sunday on the outskirts of Peshawar, 40 km from the Afghan border. Documents and computer compact discs were also seized. 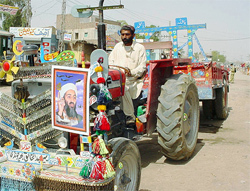 Pakistani and US Al-Qaida hunters have stepped up the 18-month search for the terror network’s chief Osama bin Laden and his top aides — including his sons and Egyptian deputy Ayman al-Zawahri — since the March 1 capture of Khalid Sheikh Mohammed. Mohammed, believed to be Al-Qaida’s terror operations chief and ranked third after Laden and Al-Zawahri, was arrested in Rawalpindi along with September 11, 2001, terror attacks financier Mustafa Ahmed al-Hawsawi, a Saudi national. An Egyptian, who was arrested in a raid of an al-Qaida safehouse in Pakistan’s border town of Quetta, made a deal with the USA to reveal Khalid’s whereabouts in exchange for money, a Middle-East intelligence official is quoted as saying in a report in the coming issue of American news magazine, Newsweek. The Egyptian, who was not identified, offered to dime out Mohammed, but demanded an additional 2 million dollars to relocate to Britain with his family. The Pakistan Information Minister, Mr Sheikh Rashid Ahmed, who was in Abu Dhabi on his way to attend the OIC information ministers’ meeting in Cairo, said he would raise the Kashmir issue at the two-day meeting of the 56-nation grouping, beginning today. He said New Delhi’s assertions about Pakistan-backed infiltration of militants into Kashmir were “rubbish”, adding India should accept Islamabad’s proposal to increase the number of UN observers along the Line of Control (LoC) in Kashmir to monitor any infiltration, The Khaleej Times reported. Pakistan, during a UN Security Council debate on Iraq a few days ago, raked up the Kashmir issue to the surprise of the diplomats, asserting that it was Islamabad’s policy to raise the matter at every forum, but failed to generate response from the members. Pakistan is a non-permanent member of the 15-member Security Council. The Prime Minister, Mr Atal Behari Vajpayee, had spoken to the US President, Mr George W. Bush, over the telephone on March 4 and conveyed the Indian position that it was willing to resume dialogue with Pakistan on all issues when Islamabad stopped cross-border terrorism. Upon being alerted by one of the neighbouring countries of a mysterious ship in the international sea waters waiting to enter the Sri Lankan waters, an off-shore patrol vessel spotted the ship and ordered it to halt for checking. “The ship did not comply with our orders, though we fired some warning shots in the air. But the men on board fired at our vessel damaging it and wounding four sailors. We fired back at the ship, which caught fire and sank in the deep sea subsequently,’’ the naval official said on condition of anonymity. “Considering the location and sequence of the incident, we strongly suspect that it could have carried weapons and fuel for the LTTE,’’ he said. The strike was called in protest against the move to export gas, retrenchment of workers, price hike of essentials and deterioration of law and order. At least four students of Jhangirnagar University, who are also leaders of the Chhatra Union, a student wing of the Communist Party of Bangladesh, were picked up, a party source said. Other arrests were made in western Jessore, Gazipur in the north and Narayanganj, southeast town near the capital.